Taking a step back on seriousness for today, www.JustBeardTrimmers.co.uk is going to take a look at some of the most famous cartoon beards thats have had the opportunity to bless our TV screens, from a whole host of different decades do you remember any of these crazy cartoon beards? Maybe we should recommend them a new beard trimmer to use when they arn't busy 'hunting those pesky rabbits' and of course entertaining our children? Papa Smurf is a lovable wise character from 'The Smurfs' who is at the golden age of 542! He is the third oldest smurf after granpa and grandma smurf! He keeps a very tidy and well maintained beard for his age, we think he must be using the Phillips QC5380! Next up we have Yosemite Sam! from the land of the Looney Tunes! He is a grouchy, gunslinging prospector, outlaw and all round meanie! He has a particular grudge against Bugs Bunny, maybe he needs to team up with Elmer Fud more often? Trimming his beard might make him look a lot less mean, so we wouldnt advise him to do so! Another very famous cartoon who loves sporting a fantastic beard is of course the legenary Homer Simpson. Home Simpson, father of 3 balancing his work / life commitments means he doesnt have a lot of time to use his beard trimmer. This means he is often always found sporting his designer stubble, not a full on beard but a remarkable feature nonetheless. We think Homer would do well to keep making us laugh and not change a bit! While not necessarily a cartoon character, Gandalf the Grey from the lord of the rings deserves a mention on our list of great cartoon beards. He has captured many childrens hearts across the world and we feel his beard is a trademark that makes him who he is today. Gandalf is a wise and powerful wizard from Middle Earth, who is always willing to share and help out his friends in need. Last on our list today is the one and the only... HAGRID! We absolutely love Hagrid. 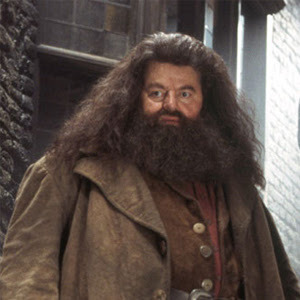 Rebeus Hagrid is the lovable game keeper from the wonderful world of Harry Potter. Having catpured our hearts with his lovable trinkets, hobbies and his loving care for Harry himself, Hagrid is a valuabe member of the Hogwarts staff. His beard is justifiably epic, true and long! It would take more than just a simple beard trimmer to tame his wild hair.